Our farm is a bustling place. As well as four permanent residents, the farm hosts five or more apprentices at any given time. Each apprentice has their own sleeping area and share a common area for kitchen, bath, and library/living room space. Apprenticing at Keala'ola Farm is an experience in communal living. Plan to learn as much about living with others as you will about organic farming - it is a tough job to do alone. We offer a work trade of 30 hours of help per week in exchange for room and board on our farm. The majority of the work on our farm is in the lettuce business. This is the bread and butter of the farm, paying the mortgage and all other associated bills and costs. Apprentices have the opportunity to learn all aspects of this business, from seeding and bed preparation to marketing and delivery. Our coffee requires periodic attention, as well as caring for our fruit trees (banana, papaya, avocado, mango, grapefruit, and more). Of course, as on any property, there is always maintenance of the farm as a whole. The work space in our warehouse where we wash, prep, and package our lettuce. The farm operates Monday through Friday, starting the day at 7am. This leaves most afternoons and weekends free for adventure, relaxation and beach time. Monday and Thursday are harvest days, when we process, package and deliver product throughout the area. Tuesday and Friday are prepping and planting days, spending most of our day out in the field. Friday is usually spent seeding all of the lettuce starts, as well. Wednesday we spend caring for the coffee and doing other farm maintenance projects. As well as use of the facilities, we try to meet apprentices' food needs. We provide a food stipend of $50/week as well as everything grown on the farm. Our own coffee is available for those who are interested. We try to accommodate weekly trips to the market, although there are many markets within walking distance. We are located in the small town of Kealakekua, which hosts a post office, cafe, bank, and other conveniences. There are laundry facitilites on the farm. So far our apprentices have found this arrangement healthy and enjoyable. 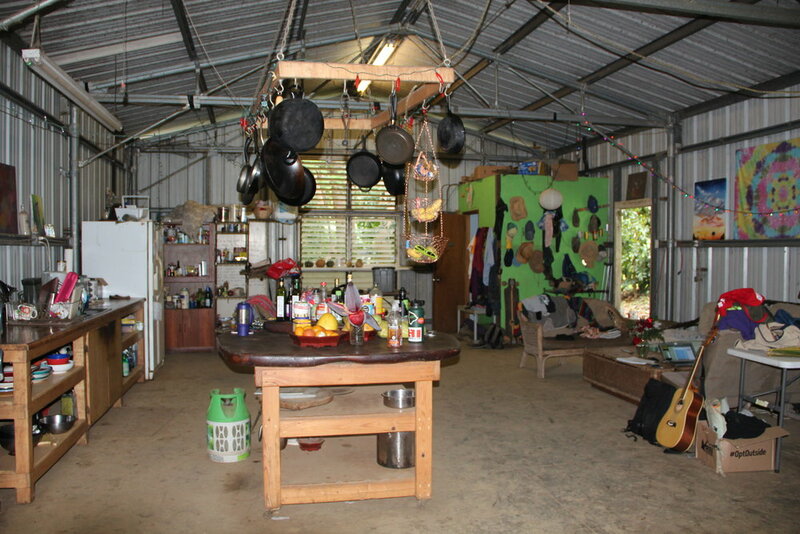 The community space in our warehouse where our apprentices hang out and cook meals. We recommend at least a two month stay at the farm. This gives apprentices time enough to get a good idea of what it takes to make the lettuce business happen and learn something about growing their own food. Of course, the longer you stay the more you will learn. Barry is still learning lots every day even after years of farming. Though we prefer people to stay longer than two months, shorter stays have been arranged. An apprentice tent on the farm. Inside one of the apprentice tents. If you are coming to stay on the farm, be prepared for warm weather and dirty farm work. Long sleeve shirts and pants are good to have for sun protection and for kneeling in the soil on planting days. A pair of work gloves is a great asset, as is a pocket knife of some kind. A good flashlight or headlamp is a great thing to have for getting around the farm at night. Bug spray and sun screen will certainly come in handy. We have some sheets and blankets, but most apprentices travel with a sleeping bag or bedding of some sort. There is great snorkeling and swimming nearby, so whatever equipment you have for those activities is very useful. Other than that, just bring your personal belongings and a good helpful attitude. If you are interested in coming to the farm, please fill out an Apprentice Application and e-mail it to kealaola.applications@gmail.com. When we receive the application, we are happy to discuss about what opportunities are available.